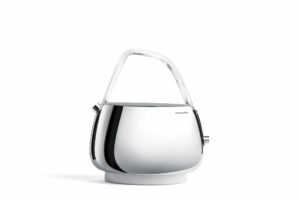 The Jacqueline kettle, proposed by Bugatti, won the 2019 Born Awards, the design competition conceived by Jean-Christophe Chopin, in the Technology category. The award, in partnership with Land Rover, now in its ninth edition, celebrates this year all the products standing out not only for aesthetics and for functionality, but also for “desirability”. The conception of the Born Awards stems from the eclectic approach of the Born team, the platform that collects and supports the creativity of the best nationals and internationals companies, which make design their flagship. The kettle is shown together with the winning products of the other categories of the 2019 Born Awards during Milan Design Week at the Born exhibition space, in collaboration with Land Rover. Jacqueline, the kettle born from the creativity of Innocenzo Rifino and Lorenzo Ruggieri, combines IoT Technology and style; it allows to check every aspect of the infusion process and, when in use, its base lights up. Its shape recalls the iconic shape of a bag and it is inspired by the traditional ceramic teapot, here reinterpreted with a contemporary touch.